Made of heavy duty 17AWG wire, Tesla's 12V socket plug significantly outperforms the competition. Transfer more power safely and efficiently than 16AWG wire. If your car is 12V, your electrical equipment should be less than 180W. If your car is 24V, then your electrical appliance should be less than 360W. 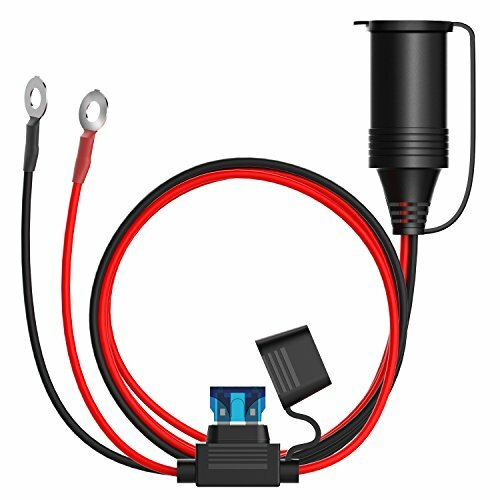 This 12V battery adaptor with eyelet terminal is perfect for all of your 12V application, such as tire inflator, vacuum cleaner, coffee maker and more. Backed by the trusted Tesla's Electronics 100% customer satisfaction guarantee. Any question, please email us: teslaselectronics1@hotmail.com. We will ALWAYS replace a faulty product or refund your purchase.